The south lawn is long and broad and more open than the north lawn. The White House uses it to host the annual Easter egg roll and other outdoor activities. The lawn has many old trees that provide privacy and security to the White House as well as the first family's tennis court, swimming pool, and other diversions. Marine One, the presidential helicopter, lands on the south lawn to pick up and drop off the president. The original south fountain was installed in 1865 and featured classical fish figures. The current south fountain of the White House has several jets of water. A quarter mile jogging track was installed around the south drive in 1993 because President Clinton's jogging habit disrupted Washington traffic, but he faced criticism in the press for it (although the $30,000 track was privately funded) and found the south lawn to be too open. The Clintons converted a third floor room to a workout room. 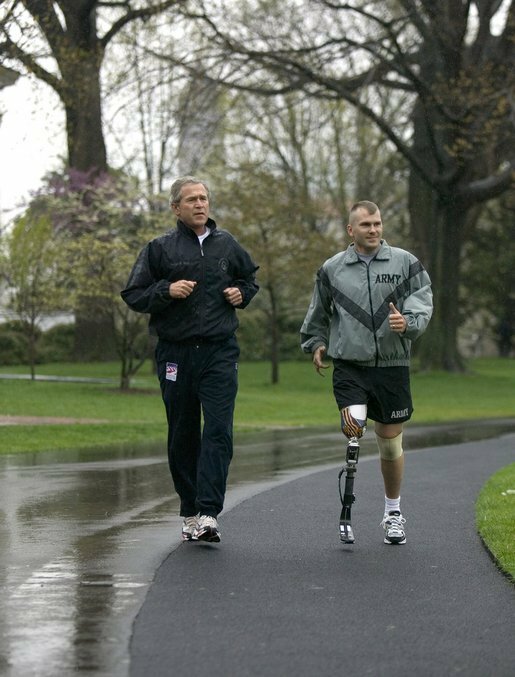 George W Bush has used the spongy, 4-foot-wide path more frequently. 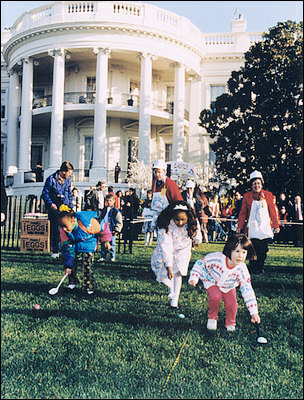 The south lawn is the site of one of the White House's most treasured traditions: the annual Easter egg roll. 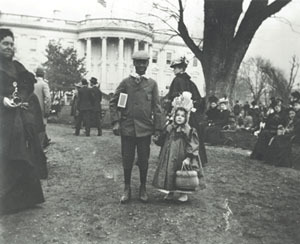 Rolling eggs on the Monday after Easter was a tradition observed by many Washington families in the 19th century, including those of the president. Public egg-rolling celebrations were originally held on the grounds of the Capitol at least as early as 1872. But in 1876 Congress passed the Turf Protection Law to prohibit the area from being used as a playground. After a rain-out in 1877, President Rutherford B Hayes opened the gates to the south lawn in 1878. Over the years, the egg rolls have evolved and changed, with different games and amusements popular in different years. Near the end of the nineteenth century, children played "egg picking," "egg ball," "toss and catch," and "egg croquet." Soon the event evolved into a more elaborate affair, with bands, entertainers and food. John Phillip Souza and "The President's Own" Marine Band performed for the assembled crowd, while vendors of all kinds sold their goods in 1889. Forty years later, Lou Hoover, wife of President Herbert Hoover, briefly instituted folk dances and maypole dances. At her first egg roll in 1933, Eleanor Roosevelt greeted White House visitors as well as listeners on the radio. She also introduced more organized games, but it was not until 1974 when the most famous event of modern Easter egg rolls, the egg-rolling race, was introduced. Subsequent celebrations included a circus and petting zoo in 1977 and exhibits of antique cars, Broadway shows, and giant balloons as well as egg hunt pits were introduced in 1981. Children would search straw pits for autographed wooden eggs. A new tradition at the White House is the annual South Lawn Sluggers tee ball game instituted in 2001 by George W Bush, former owner of the Texas Rangers. The game seeks to promote health and fitness as well as an appreciation for the game and for sportsmanship. President Hoover’s advisers often came to the White House for breakfast and exercise. Hoover and members of his Cabinet played a game they called "Hoover ball" on the south lawn of the White House. Play involved throwing the heavy medicine ball over the net.